If It's Too Loud...: Stella Donnelly - "Lunch"
If we were excited about the upcoming full length debut from Stella Donnelly, "Lunch" has whipped us into a frenzy. Her previous single, "Old Man," was more of a pop song than the more folk side we had expected from Donnelly. "Lunch" is back more on the folk side of things, especially at the start. As the song builds, it becomes much more layered and complex, but in a very quiet way. The song is about being a touring musician and being away from home for extended periods of time to the point that everything feels different when you come back. As Donnelly sings: “You’ve got plots and persuasions and time to explain/But I’ve only got time for lunch/And I get homesick before I go away.” It's a heartbreakingly stunning song, made more so by Donnelly's voice. She really croons on "Lunch" in a way we haven't heard before, but I think we'll all want to in the future. You can watch the video for "Lunch" below. Stella Donnelly's debut full length album, Beware of the Dogs, will be out March 8 on Secretly Canadian. You can pre-order a copy here. 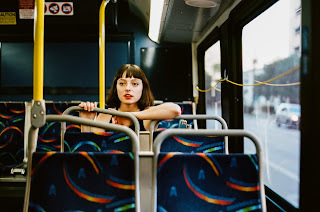 For more on Stella Donnelly, check out her website. Current tour dates are below the video.